I had a great time participating in the 2019 Spring Surprise Swap. Tony (GR8HUNTER) was my recipient; this guy makes some amazing things. My gifts to him aren’t lookers, but hopefully he finds them useful. Shoulder Plane: Wanted one for a long time. Unfortunately I ran out of time and couldn’t make another one to keep for myself. The iron is from Hock Tools; I first tried a Rockler iron and it’s worthless (just ask Kelleycrafts). 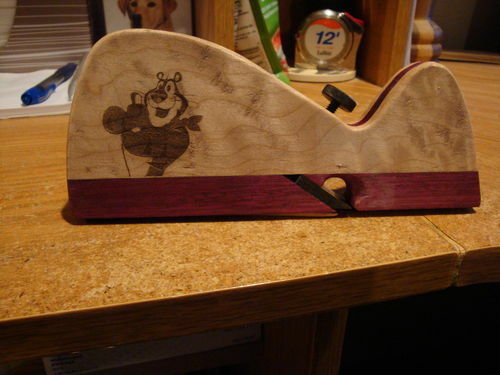 Plane sole and core is purpleheart, sides are maple. This plane uses a thumbscrew instead of a wedge, I hope that makes it much less finnicky to set. For anyone who doesn’t know, the shoulder plane has a blade that is as wide as the sole, which necessitates its unusual construction but allows one to clean the inside corners of tenons and the like. Bow Sander: Body is a mystery wood. I ripped into thin strips, heated and clamped into a curved form, then glued and clamped into the curved form. Maple jaws hold the sandpaper in place. Seems like something Tony could use for his model-making. I should probably make one for myself too! 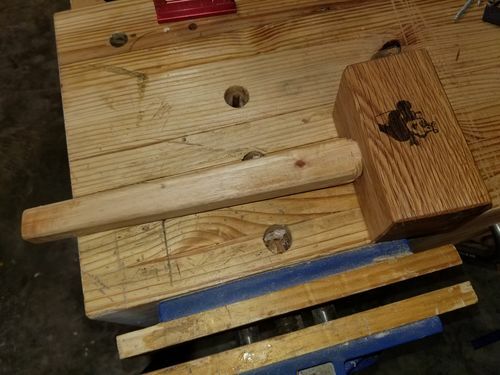 Mallet: Head is white oak, handle is pecan. 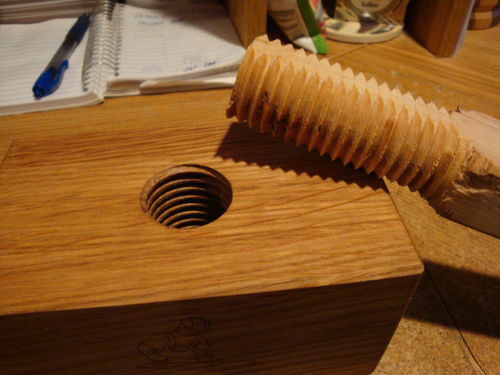 I turned a round tenon on the end using a file box, then threaded it to fit the head. I figured Tony may want to refine the handle to his grip before securing it into the head. 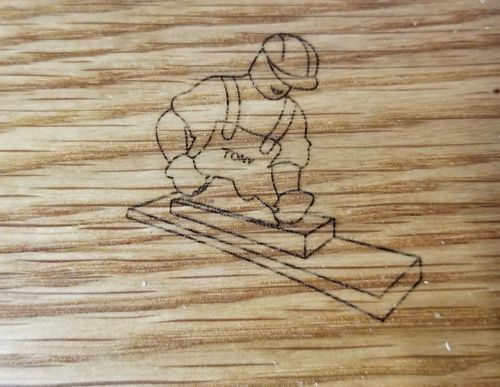 Laser engraving: A thread here introduced me to an inexpensive laser engraver on Ebay. I put Tony’s Tony the Tiger motif on one side, and a rendition of the LJs logo with “Tony” on his apron on the other side. Thanks to Kelleycrafts for a rendered logo too. Had a great time, can’t thank everyone enough for the tremendous help on these and numerous other projects. I may not have time or skill for the next swap but I hope to do this again sometime. Looks plenty skilled to me, John. Glad I didn’t go with my original plan for a shoulder plane, yours is nicer than what I originally planned. Well done John! I’m sure Tony will get a lot of use out of all of your gifts! John, your stuff is awesome. Definitely “lookers”! A lot of work and creativity went into this set and I’m sure Tony will get a lot of use out of them. Don’t sell yourself short buddy, you have amazing skills! The laser engraving is a really nice personalized touch. 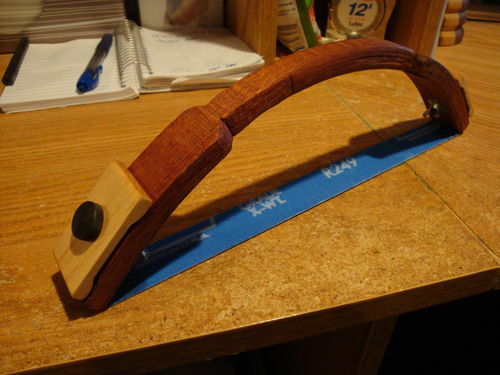 I will be making a bow sander once the dust settles from the move in 4-5 months. Thanks for participating in the swap. Hopefully, you will be able to try some more swaps. All of these tools look really useful and very well made and pleasing to the eye. The Tony the Tiger motif is killer. Nice job. Great batch of tools. The quality really shows. I bet they will be a pleasure to use. I think we all would have been proud to receive. Awesome work John! All extremely useful tools and the woods and personalization make it an excellent package! Well done John! All those items are really useful and don’t short yourself on their looks, they look great. The bow sander is brilliant.